Muscat & Viognier (roughly equal parts), with 5% Marsanne, 5% Grenache Blanc. Light white gold in color, this wine has briny minerals on the nose with lime/citrus on nose and palate. Elegant and rustic all at once, yet completely unpretentious, there is plenty to get excited about! Muscat and Viognier impart lovely aromatics, perfume and acidity. Floral notes of light orange blossom and edelweiss give way to stone fruit and white peaches. Marsanne and Grenache Blanc provide the body and richness. Clean, dry, refreshing finish. This bottle is seriously gone before you know it! Perfect summer enjoyment ... better get two! (around $15/bottle at Browne Trading Co. in Portland). Château Coupe Roses' vineyards are located in the Minervois appellation of the Languedoc region of France (south near the Mediterranean) on an arid windswept, plateau above a cliff at 750 - 1,350 ft. above sea level. These vineyards reside in the two highest zones in the Minervois, Le Causse and Le Petit Causse, names that refer to exposed rock and garrigue, calcified limestone to be exact. The name "Champ du Roy" means field of the king. Winemakers Françoise Le Calvez and her enologist husband Pascal Frissant are hands-on and passionate about their wines. "At Coupe Roses, the sum total of high-tech wizardry is confined to the modern winery press and the narrow gauge Lamborghini vineyard tractor" (Vintage '59). 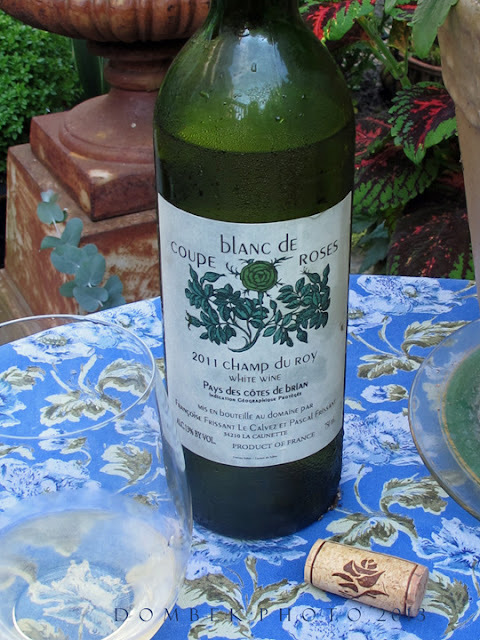 The Vin de Pays designation is only because Viognier is not allowed in Minervois AOC wines and in no way reflects the quality or sophistication of this wine. In fact, François Serre, a friend, colleage and consulting enologist at Château Rayas in Châteauneuf-du-Pape is also consulting enologist at Coupe Roses. Tres Bien! Brought to us in the northeast by CRUSH Distributors through Vintage '59 Importers, Washington, DC. Ask your local market or restaurant to carry it!